ACCORDING to the Psalmist: “The days of our life are seventy years, or perhaps eighty, if we are strong” (Psalm 90:10). From that point of view, if from no other, I share these reflections from a position of strength. He assured me that my rather facetious response, “a sinful one”, did not add to his store of knowledge; for, as he pointed out, while sinfulness is not generally considered a requirement for being a Christian, it is undoubtedly a characteristic of all who claim to be one. Even Pope Francis, the man whom we call the Holy Father, admitted to being a sinner in one of the first acts of his papacy. “I am a Christian in the Roman Catholic tradition,” I said – thereby identifying (according to my understanding of the terms) my faith (Christian), my religion (Catholic) and my canonical/liturgical rite (Roman, Latin, Western – as distinct from Eastern). These days, in identifying my religious commitment, I prefer to use the time-honoured word “Christian”. As Luke notes in the Acts of the Apostles, the disciples of Jesus, the followers of the Way (Acts 9:2, etc. ), were first called Christians during the very fruitful ministry of Paul and Barnabas in Antioch (Acts 11:26). I hope that the term means as much to me as it did to St Cyprian, the Bishop of Carthage, who was martyred on September 14, 258, in the time of Emperor Valerian. He wrote to his friend Donatus: “I have discovered in the midst of (an incredibly bad world) a quiet and holy people who have learned a great secret. “They have found a joy which is a thousand times better than any pleasure of our sinful life. “They are despised and persecuted, but they care not. “They are masters of their souls. “They have overcome the world. Very much in keeping with those sentiments is a modest plaque in what was once Cardinal John Henry Newman’s titular church in Rome – San Giorgio in Velabro. It identifies the great man as a theologian, a supporter of ecumenism and a member of the Oratory of Saint Philip Neri but, above all, a Christian (sed ante omnia Christianus). I am sure that this qualification would find favour with the humble Pope Francis – a man of many official titles: Bishop of Rome, Vicar of Christ, Successor of the Prince of the Apostles, Supreme Pontiff of the Universal Church, Primate of Italy; Archbishop and Metropolitan of the Roman Province, Sovereign of the State of the Vatican City; Servant of the Servants of God. If these were proclaimed in his presence, I feel sure that he would add “sed ante omnia Christianus” and perhaps “peccator’” (sinner). 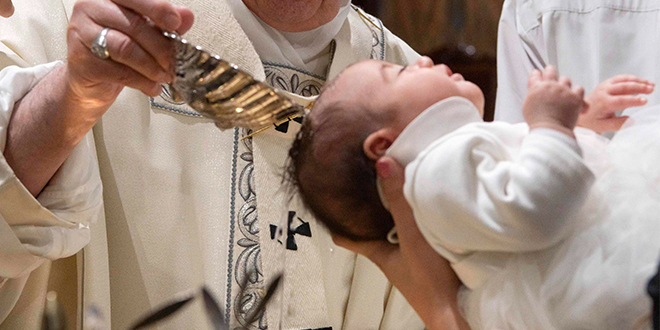 It should come as no surprise that Pope Francis attaches great importance to the sacrament of baptism – an initiatory rite which, for him, goes straight to the heart of the matter of being Christian. He urged them to find out and to celebrate the day in future with gratitude. He could have told them that he himself had been baptised in the Basilica of Mary Help of Christians and St Charles Borromeo in Buenos Aires on Christmas Day, 1936. For my part, I could have informed him that the date of my baptism by Fr Andrew Wogan OFM in the Little Flower Church, Kedron, was April 2, 1934. By the grace of God, I remain a Christian in the Roman Catholic tradition.